What we learned from the Dubai Sevens, Barbarians match at Twickenham and the Pro14, according to CRAIG LEWIS. The Springboks Sevens came into the opening tournament of the 2017-18 season as defending Sevens Series and Dubai champs. Understandably, high expectations follow their every move, and yet they looked utterly out of sorts over the two days at the Dubai Sevens. After battling past Samoa, the Blitzboks’ ill-discipline let them down in their final pool game on Friday as they slipped to defeat against Argentina. That result sent out some warning signs, and the Springbok Sevens were then well and truly outplayed by England in their Cup quarter-final as they plunged to a humbling 22-5 defeat. It’s not often that the Blitzboks have been made to look so ordinary and they struggled to offer any real penetration on attack, while their tackling left a lot to be desired. It’s a serious reality check for the Blitzboks as they now head towards next weekend’s highly-anticipated home tournament in Cape Town. Of course, it has to be remembered that the team is in a rebuilding phase following the departure of several stalwarts, but they will be mightily disappointed with a sixth-place finish in Dubai. It’s been a difficult year for Lood de Jager on the injury front. 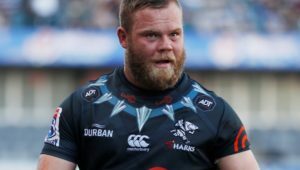 After finding top form during the early parts of Super Rugby, he then suffered a torn pectoral muscle against the Sharks that was expected to rule him out of action for four months. The injury ultimately proved worse than feared, with De Jager forced to go under the knife once again. Although the 25-year-old did manage to return to action on the Boks’ recently concluded end-of-year tour, his game time was limited. However, he enjoyed a long-awaited start for the Barbarians in Saturday’s clash against Argentina, and certainly made the most of it. 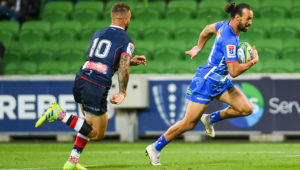 The 2015 SA Player of the Year delivered an industrious performance that reminded viewers of his immense all-round ability, with the big lock completing 20 tackles and scoring a try in a superb Man of the Match effort. In the professional age, there are some naysayers who question the relevancy of Barbarians rugby. With Saturday’s clash between the composite team and Argentina coming at the end of a long season for southern hemisphere sides, there were further questions about the need for players to be put through another game. However, Barbarians captain Wyatt Crockett summed up the spirit of the Barbarians after they clinched a memorable three-point win on Saturday by describing just how enjoyable it had been for different players to get to know each other during the week. The Baa-Baas spirit has always been about embracing the lighter side of the game, while serving as a throwback to the amateur days when players from opposing countries would spend time together after the match. Not only did the Barbarians provide a reminder of that on Saturday, but they also produced a rousing performance to clinch a stunning comeback win over the Pumas. 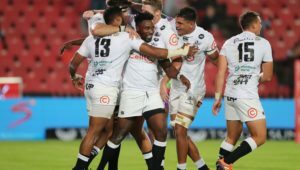 As these two South African sides head into an end-of-year break in the Pro14, there will very little reason for festive-season cheer when reflecting on their performances so far this season. On Saturday, the Kings succumbed to a three-point defeat to Benetton Treviso at home and remain rooted to the bottom of Conference B. It’s hardly been much better for the Cheetahs, who slipped to a loss against Connacht in Bloemfontein, and it’s only Zebre who prop them up from the bottom of Conference A. Although the Cheetahs impressed by reaching the playoffs in their debut season in the Pro14, they now already look well and truly out of the running. 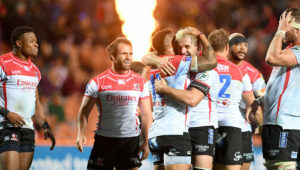 Soon, questions will have to be asked about the value that these two teams are adding to the competition, and indeed the benefits for South African rugby.